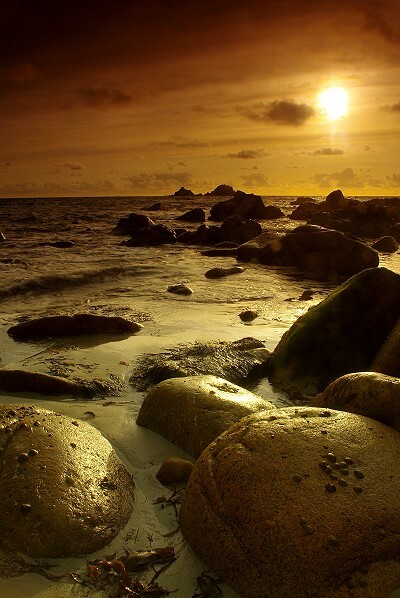 Porth Nanven, also known to the locals as the Cot Valley, is a site of special scientific interest and requests are made that none of the rocks be removed from the beach. The rocks in question are smooth round granite boulders of all shapes and sizes. This is a popular location for photographers to obtain their sunset pictures but on this evening there was only myself and another guy so I didn't have to think about getting in anybody else's way! The rocks on the horizon are known as 'The Brisons'. Porth Nanven may be reached by taking the minor road from St Just to Cape Cornwall, and then turning left and following the signs for 'Cot Valley' as it narrows, twists and meanders it's way all the way down to the sea.